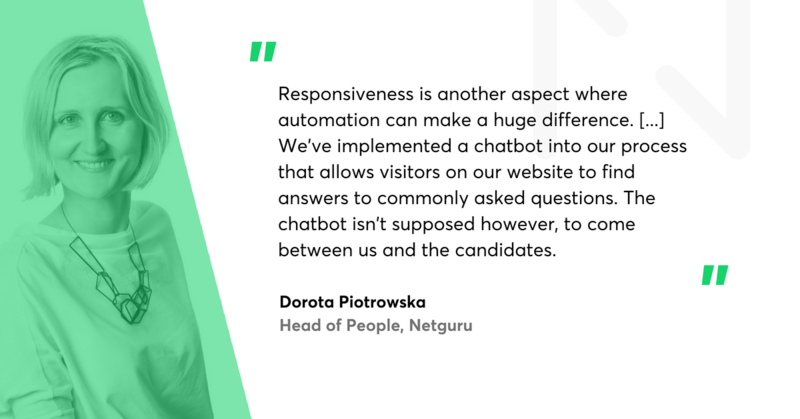 In this interview with Dorota Piotrowska, Netguru’s Head of People, we dive into the (sometimes murky) waters of modern recruitment on the challenging IT market, to talk about the processes, best practices, and the challenges we face every day. The rules of modern recruitment - what are they? First of all, the process needs to be short. Especially millennials get impatient after more than a week. We keep our process to a 25-day deadline, but it’s a challenge to meet candidate expectations of promptness while maintaining our quality standards. We pay a lot of attention to responsiveness. Our team strives to get in touch with candidates within maximum 3 days. Longer than that and the experience suffers. This can be very difficult, even with a team the size of ours. The numbers show it all: only last quarter involved communicating with 2,000 candidates and sending 4,500 emails. All this to disqualify 1,700 people and hire fewer than 100. It might seem to be a relatively small number, considering the effort, but we’re confident that the people we chose - and who chose us in turn - are the best possible fit. Modern tools are a must as well. Tools that are user friendly and enable analytics at all stages of the process. Workable, the ATS (applicant tracking system) we use, is additionally automated with Hubspot and Zapier (more on how we do that in this presentation by Mateusz, our recruitment tools and analytics geek). It helps us pull more complex data and statistics on all stages of the recruitment process and optimise the elements that need to be improved. We then feed selected data to the People Dashboard in SalesForce. Qualitative metrics are an integral part of our analysis too. We work on improving the quality of our performance, based on candidate experience surveys. People already hired fill those too, but the insights from candidates who were rejected are even more valuable. Thanks to them, we avoid bias and resting on our laurels. You mentioned that feedback is extremely important. What other elements are crucial? Netguru’s employer promise is that every candidate receives individualised feedback after the process ends. This is how we aim to maintain a truly positive candidate experience. People feel like we’re entering a partner relationship, that we’re attentive, and that we treat them as equals. It is, indeed, one of the most challenging tasks considering the dynamics of our recruitment process and the sheer numbers of candidates and people co-evaluating them. If we lag with replying and giving feedback, the experience suffers. But we can’t let the other parts of the process suffer either. It’s a delicate balance. Another new trend we are observing is specialisation. We’re putting more focus on the activities taking place before the actual recruitment process, such as employer branding, recruitment content creation, and so-called sourcing. Content is what our marketing team, with the help of other Netgurals, produces with top quality results. EB is another crucial element of our recruitment strategy. For us, employer branding means first and foremost knowledge sharing, not only through conference presentations, but also through actively taking part in distinct activities in the community. I think we can say that it’s Netguru’s trademark that we organise regular 1 day to 2 weeks long workshops, and meetups for developers, technology geeks, quality assurance specialists, and project managers, for both market entrants and more senior people. Sourcing, on the other hand, is all about networking on SM and IT fora, posting quality content there, and building a solid network of candidates interested in what’s up at Netguru. This approach gives people more information about who we are and a better chance to make a well-informed decision when we actually approach them with an offer. We don’t send our offers straight out. Instead, we build relationships. 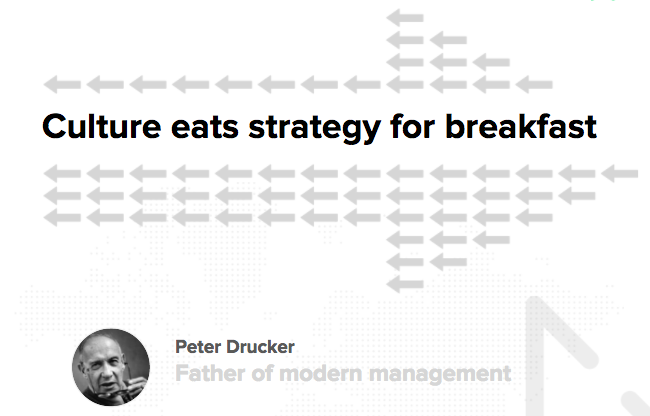 To do this, we’ve created a dedicated role in our structure: Talent Sourcer. In some organisations, this would be someone lower on the ladder than a junior recruitment specialist. We look at this differently. For us, specialised Talent Sourcers are extremely important and act as peers to recruitment specialists. What a sourcer does is unique. It’s difficult to find experienced people, because the role is nascent in Poland. The job definition is also somewhat fluid. A sourcer doesn’t simply search for people on Linkedin. Efficient sourcers need to know Google and Linkedin algorithms, they are professional searchers and relation-builders. It’s a varied and challenging job. So, one of the trends is separation combined with specialisation? Yes. It’s not just the separation of the recruitment process into recruitment marketing (done by the marketing team), EB, sourcing and recruitment. We also have separated it into two parallel, specialisms: technical and non-technical recruitment units. This separation of roles recruiters work on allows them to focus on their tasks and not get overwhelmed with a chaotic mix of different competing responsibilities and duties. What processes help you keep up with competition? The first element of the process is checking culture fit. Adam Romański, our front-end developer and a vlogger, spoke to our recruitment team a while ago. They talked about culture fit and soft communication skills. It was a bit of a surprise to some of his viewers. Many people applying for technical jobs don’t think about culture and communication skills as all that important. In our company, though, where developers work directly with clients, interpersonal skills really matter a great deal. As a remote organisation, we also need our people to have certain skills and qualities to build good relationships, both internally and externally. Communication tools make it possible for us to be efficient in the remote-teaming format, but communication via Slack, Trello or Jira is prone to distortion. Communication skills, as well as openness to receiving and giving feedback, are therefore crucial to success, ours and that of Netgurals. We build ad-hoc teams for 2- to 6-month long periods. They need to become effective fast, which means good communication and good understanding among team members makes or breaks our projects. We build teams for clients lightning-fast, and so we absolutely need to measure culture fit. We check it before we verify a candidate’s hard skill set. It’s costly for us, but it’s also a tested element of our strategy. We know we can teach people technical skills (through EB initiatives such as the Netguru Code College, for example). But culture fit and soft skills are a different matter. Does this mean you might reject potentially valuable employees? There’s no such thing as a good employee. There are skilled and engaged people, of course, but what matters is the alignment between the employee and the employer’s expectations. It has to be a reciprocal relationship. Every employee has the right to decide that we don’t align with their values or aspirations, and we retain the same right. How much of your process is automated? Something like measuring culture fit has to be done by a human recruiter, doesn’t it? We believe in the synergy of modern, digital tools with the human 2 human touch. In this business, we automate a step ahead of other industries. People who join us tend to be impressed by the tools we use, the level of automation, and also the fact that all elements of the process are meticulously measured. Responsiveness is another aspect where automation can make a huge difference. It helps us during the first contact when a candidate wants to learn more. We’ve implemented a chatbot into our process that allows visitors on our website to find answers to commonly asked questions. The chatbot isn’t supposed however, to come between us and the candidates. The human 2 human approach is more important than ever before, which means we need to be careful about where and how we use the chatbot. The goal is to improve the first experience of potential candidates during their first interactions with Netguru. The chatbot should be no more than that before a recruitment specialist comes in for a more personal touch. How do you communicate your EVP to candidates ? We try to communicate our EVP (employee value proposition): transparency, flexibility, continuous growth, constant feedback – as well as we can. Many new hires, when asked about it during our onboarding process, are impressed with how coherent our external EVP communication is and how well it corresponds with what they experience in reality. It’s rare to look at a company prior to or during the recruitment process and see the same thing you later witness from the inside. We put effort into making sure this consistency is maintained at Netguru. What about the specifics of recruiting for technical positions? You might expect more automation here, but that’s actually not the case. We have members from all major departments come in to interview candidates. We introduce these experts into the process starting with the second interview. This is when we check hard skills. Stage three is a conversation with the candidate’s future team leader. Here, the candidate can ask questions about their team, their role, and their tasks. Leaders at Netguru watch over the right career path and skill development of the given Netgural within the so-called primary structure (practice teams at Netguru, i.e. PM teams or RoR teams). It is a very important role for any Netgural, as it ensures stability and a sense of belonging for people who work within remote teams on a day-to-day basis, where group membership shifts with project completion. We can’t imagine going through a recruitment without the candidate speaking to their leader. We choose the candidate, and the candidate chooses us. Or rather, they get to choose a leader who will help them grow and spread their wings. You’d be surprised by how important this final stage of the recruitment process really is. We’ve mentioned some already, but what challenges do you need to overcome? Among the challenges we’re working on now is better operationalisation of measuring culture fit. We need to be objective and data-driven. We don’t want to rely on psychological tests though - we use human 2 human structured conversations instead. They work, but the results are still difficult to compare in a precise way between different interviewers. Surely enough, the most natural way to measure culture fit are workshops, during which we can see people in action and evaluate their work style more accurately. But it’s only one of the ways we attract and recruit people. Another challenge is to operationalize the newly-introduced specialisation of specific segments of the recruitment process. Our new team structure, as mentioned before, includes Talent Sourcers as peers to Recruiters in both tech and non-tech units. We’ve just started working on putting this new team design into practice. We are also looking for our Blue Ocean in terms of EB and candidate experience. The market is changing, our needs are increasing rapidly, and we need to boost applicant traffic. Just like everybody else. With the new design, we plan to grow our Recruitment and EB team to 12 people in Q3/Q4. This means open positions in sourcing, recruitment, and employer branding. We’re on the lookout for engaged, open-minded people with a can-do attitude, positive energy, and a love for technology. This is what our current recruitment & EB team is all about :).